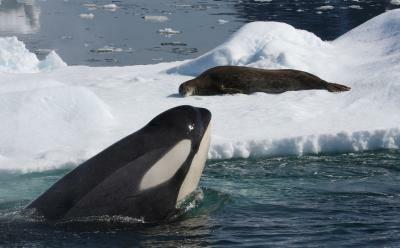 Packs of killer whales off of the western Antarctic Peninsula, renowned for their cooperative hunting tactics in downing seals, have been found to be very fussy diners. So says work to be published in the journal Marine Mammal Science. 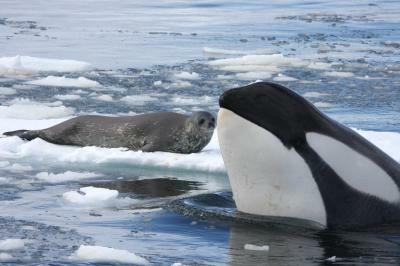 Careful observation during the Antarctic summer, back in January 2009, has shown that orca are homing-in on Weddell seals, in preference to other more abundant seal species. The pair also documented some astonishing acts of planning and cooperation amongst the killer whales, to ensure they snagged their prey. These particular pods of orca, labeled by the scientists 'pack ice killer whales', would first scout out their intended victims by 'spy-hopping' out of the water, to spot Weddell seals resting on ice floes. Once a likely victim was identified, the scout would bring other members of the pack to bear in some amazing and relentless hunting tactics. The orca would act in concert, sometimes charging seven abreast, towards the ice floe. 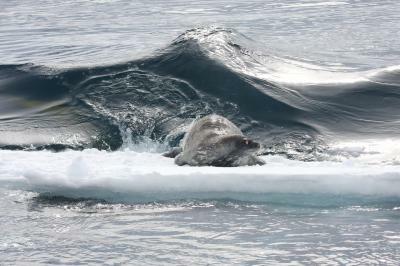 This creates sudden large bow-waves, which can wash the seals off of their icy perches - or break the floe up, leaving the seal more isolated. Having washed the hapless seal into the water, the orca then sought to encircle, trying to stop it from escaping back to the safety of an ice floe. They were observed thrashing their flukes, and blasting bubbles through their water holes, in an apparent attempt to confuse and disorientate the seal. Rather than killing the seal directly, members of the pack would pull it underwater repeatedly by its hind flippers, until it was too exhausted to swim - and so drowned. The cooperation didn't end there. Having worked together to ensure the kill, the seal carcass was often divvied up amongst pod members under the waves. This behavior is thought to be unique to this group of killer whales, leading to the pair to suggest that they could even be a separate species. The reason for their preference for Weddell seals wasn't investigated, but was pronounced due to the Weddell's low numbers compared to crabeater seals. Weddell are, however, larger and fatter than crabeater seals, growing up to 3 meters in length. So it's possible that larger is tastier for orca taste-buds.